When we furled in the main sail, it was touch and go whether we'd get the sail all the way in with just the UV cover showing. There was invariably some sail materiel showing outside the mast once the inhaul furling line reached the stop on the boom. 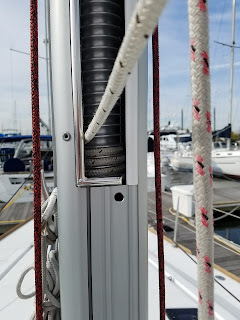 The furling line was also pulling on the bolt which attaches it to the furling unit, there were no wraps around the furler at this point, the line just came straight back from the furler. Now, I was thinking I would add a couple of extra wraps on the furler when we drop the main sail but a neighbor on my dock said I should be able to do it without dropping the mainsail. 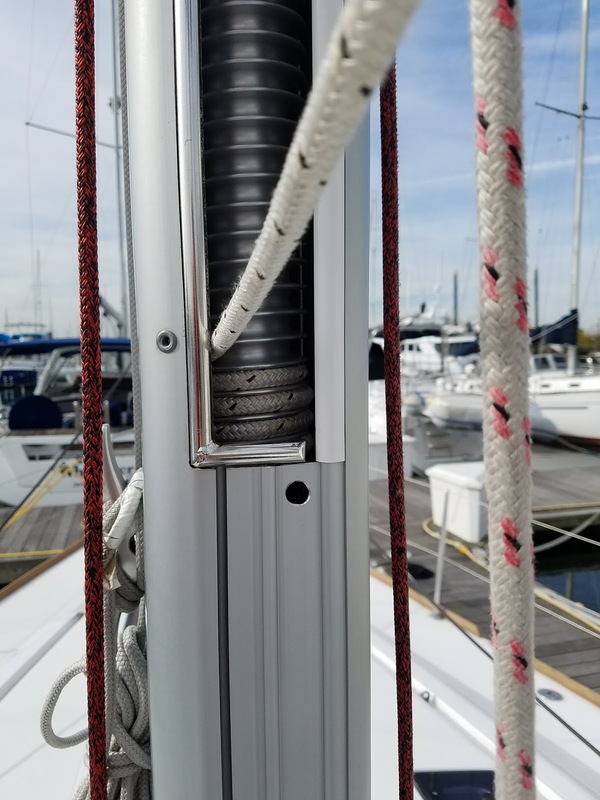 Just pull the furling line through the deck and the blocks, then push the end around the furler unit a couple of times and then pull it back through the deck. There were no wraps on the furler at all before I did this. The in haul line is pretty crappy, I don't believe it was new because it was pretty hard and has lost flexibility. I'll replace it soon. The other thing is that the line was already not long enough to get 3 wraps around the cabin winch so with these 3 wraps on the furler, that took maybe another foot out of it so the stopper knot almost meets the cabin top clutch for the in haul now. It definitely needs to be about 10 feet longer. I think this is why they rigged it the way they did. They seem to have had an odd piece of line which they used for the in haul and to have enough line at the winch, they didn't wrap the furler unit. Anyway, it furls really easily now all the way in with no issues besides the in haul line stopper almost makes it to the clutch now but that's ok for now.